Adding a splash of colour to your garden is easypeasy! To be frank, that's a bit how I feel about gardening. Anyway, Jenna was kind enough to offer us 4 ways to improve our garden this Summer. Thank you very much Jenna. It's greatly appreciated. If you’re a keen gardener, you’re probably already out in your garden enjoying some of the great summer sunshine. There are so many different ways that you can enjoy the summer without having to organise an expensive vacation. One of our favourite ways to do this is to take some time to fix up your garden and turn it into the garden that you’ve always dreamed about. If you’d like to get some tips on how you can improve your garden, keep reading below! If you want to make your garden stand out – add some colour! You can do this in many different ways like planting some beautiful flowers, adding some colourful fencing or even decorating your plant pots. Don’t be afraid to add some bold colours as these will stand out the most against your green hedges and bushes. Mix and match colours, you’ll find that plants like a purple anemone will go great with bright yellow coloured California poppies! Another great way that you can improve your garden this summer is to invest in a steel building. You can use a steel building for many different purposes from storage to an outside studio or a play space for your children. You can get steel buildings in all sort of shapes and sizes from Armstrong Steel who will price your building up for you online, so make sure to find one that is right for you and you’ll love how it improves your garden. If you already have garden furniture, then you might not necessarily want to fork out for some new versions. One way that you can get around this is by getting creative and updating how your current garden furniture looks. You can do this by painting it or adding cushions, there are so many options! If you’d rather buy new furniture, then this is another way to improve how your garden looks and make you feel more comfortable in it. Our final way that you can improve your garden this summer is by starting your own little vegetable patch. If you have enough space, try growing some peppers or tomatoes and you’ll be able to make your garden look great. The great thing about this is that you can also feed your family for free with the amazing vegetables that you will be growing. Growing vegetables can be fun as you watch them go from seeds to amazing food. Improving your garden can be a fun activity and you don’t need to let it feel like a chore. If you have some nice weather to enjoy this summer, then think about our 4 top tips and see how you can adapt them to your garden. Once you’ve updated some of your furniture and planted some colourful plants, you’ll love spending time in it and your friends and family will to. See how you can improve how your garden looks and feels today! Thanks again Jenna for a great article about gardening. I especially like the tip about adding colour. In my opinion you can never have too much colour in a garden. The more the merrier, is what I say! And you don't have to use plants to add color. You can use garden gnomes for example! 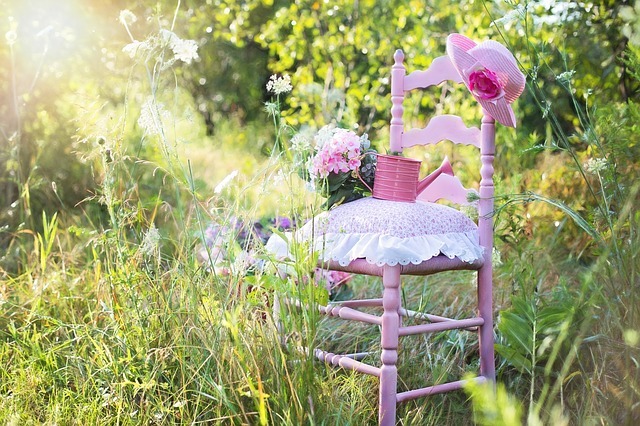 Or a cute, decorative chair, like in the picture in this post. How do you feel about gardening? Is it a hobby or a chore for you? I love having a garden, even if it's just a few things. I love adding colorful flowers and a veggies. It's definitely fun, not a chore. :) Thanks for sharing your post with us at the #HomeMattersParty this week.